UPDATE: BROOKLYNVEGAN PRESALE PASSWORD HERE. 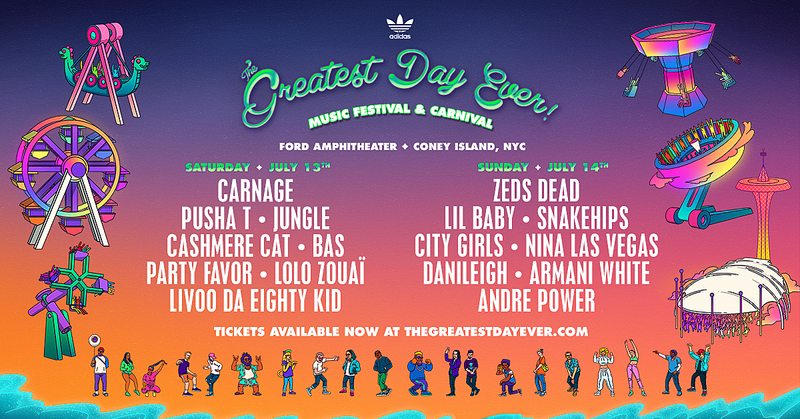 Annual NYC electronic/rap fest The Greatest Day Ever is moving from The Bronx to Coney Island this year. It happens across two days at Ford Amphitheater at Coney Island Boardwalk, July 13 & 14, and the lineup includes Pusha T, Cashmere Cat, City Girls, Lil Baby, Bas, Carnage, Jungle, Zeds Dead, Snakehips, and more. Full lineup below. Tickets go on sale Friday (2/22) at noon, and there’s a BrooklynVegan presale starting Thursday (2/21) at 10 AM. Check back here Thursday morning for the password.